Barcelona Airport is about 15 kilometers from the city gates. Formerly "Barcelona El Prat de Llobregat" was a rather contemplative airport with short distances, it has now become more than twice as large as the T1 opened in 2009. The old terminals A, B and C have become T2A, T2B and T2C. There are free shuttle buses every 5 minutes between the T1, the train station and the T2. Despite its size, it is still easy to find your way. Here's how you get from the airport to Barcelona's city centre. You can book the tickets and transfers here. Barcelona Card + Hola BCN! Arrival From the Airport with the Barcelona Card + Hola BCN! With the Hola BCN! ticket, you get free public transport in the city area of Barcelona for 48, 72, 96 or 120 hours from your first use. The Hola BCN! ticket is included with other benefits in the Barcelona Card. The Hola BCN is valid for Bus 46 from Terminals T1 and T2 (not for the Aerobus), the train from Terminal T2 and the Metro L9 from T1 and T2. In the city you can continue with the metro or the busses of the TMB. On request we will send you the tickets and Barcelona Cards by post (shipping costs € 4.90). You can also pick them up with our vouchers directly in the terminal buildings (opening hours at Barcelona airport are 8:30 to 20:30, closed on 1 January and 25 December). On the bus you have to validate the Hola BCN in the validator, for the train and the metro you need put the card in the access control. The machines recognize the first time of use with the magnetic strip. Our driver or travel guide welcomes you directly in the arrivals hall and brings you to your hotel in the city of Barcelona for a fixed price. You will be picked up from there and taken to your departure terminal. With the Arrival Sightseeing Tour, we will show you the most beautiful sights of the city in a 3- or 4-hour private city tour. You have plenty of opportunities to stretch your legs. Book a breakfast or tapas break with the tour. Booking is easy: select the vehicle and enter your desired date and time as well as the scheduled arrival time of the aircraft. Then click on "Add to cart". 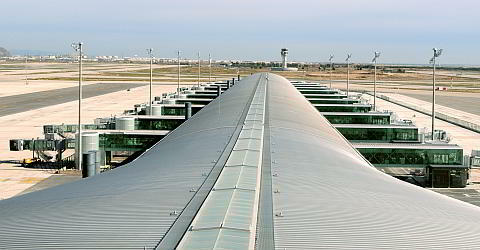 Getting to the "El Prat de Llobregat Airport", as the Barcelona Airport is officially known, is quite simple. There are several transfer options available to get you from the airport to the city center: you can easily get to the city either by public transport or with a private transfer. Depending on the size of the group or comfort wishes, we offer you the right means of transport. The multi-day ticket is valid from the airport for the entire metropolitan area of ​​Barcelona for 2-5 days (48-120 hours). You can use the city bus, metro, tram and trains for free and as often as you like with the Hola BCN ticket. The urban bus routes 46 and N17 are the cheapest way to get into the city. It’s even free if you have the Barcelona Card or the Hola BCN ticket. However, they are not so comfortable - there are no luggage racks and there are many bus stops to take on more passengers. Single tickets can be obtained from the drivers, if necessary, but no multiple or multi-day tickets. Bus 46 ends at Plaça Espanya and the N17 at Plaça Catalunya. The single ticket purchased from the driver is valid only for the bus, you can not change to the metro afterwards. The way is the same as to the Aerobús stops: after security go straight ahead until you reach the exit for the bus stops. For the bus stop of bus line 46 you need to walk about 150 metres. Both bus stops are clearly signposted. After security go directly to the exit on the road, then go about 100 meters to the right up to the bus stops for lines 46 and N17. The bus line 46 operates from 5:30 to 0:45 from the airport, and in the opposite direction from 5:00 to 0:15. The line N17 operates from 23:00 to 5:00. The journey takes about 40-60 minutes depending on the time of the day. The buses leave every 25 minutes. You should plan sufficient time for the return trip to the airport. Lines 46 and N17 stop at Plaça Espanya on the side of the exhibition centre, the 46 has its terminus there. The entrance to the Metro station Espanya (lines L1, L3 and L5 as well as several other trains) is about 100 meters from the bus stop, near the two Venetian towers. The N17 has its final stops at Plaça Catalunya. Direction to the airport: The Bus 46 to the airport leaves from Plaça Espanya at the "Las Arenas" shopping center. The trip from Plaça Espanya to the airport Barcelona terminal T2 takes about 45 minutes, to terminal T1 about 1:10 hours. The Aerobús is a shuttle bus that takes you directly to the city centre. On the bus there is plenty of storage space for luggage, you do not need a timetable, the buses run in a tight cycle every 5-20 minutes. From the airport to the city centre the Aerobús operates from 6:00 to 1:00, 365 days a year. In the opposite direction, the bus leaves from 5:30 to 0:30. Here you can book the Aerobús ticket online. Since the Aerobús is operated privately, the Barcelona Card or the Hola BCN ticket are not valid there. The trip to the city centre takes about 35 minutes. Click here for more information and prices of Aerobús. Follow the signs to the bus stops: after the security area go straight ahead, turn right past the café, then right to the bus stops exit (that’s the second exit, the first exit leads to the taxi ranks). When you arrive on the lower ground floor, you arrive directly at the Aerobús stop. To find the bus stop, when you come out of the exit beside the tourist information turn left after about 50 meters. There you can already see the blue Aerobús. Upon arrival, both A1 and A2 bus lines will take you to Plaça Espanya, then to the Gran Via-Urgell, Plaça Universitat stations and Plaça Catalunya, the last stop. On the return trip be sure to get on the right bus (A1 for terminal T1 and A2 for terminal T2) and please note that the bus does not stop at Plaça Universitat, so you need to get on at Plaça Catalunya. Our driver will be waiting for you right in the arrivals hall, they will take care of your luggage and on request will help you to check in at the hotel. There are private transfers by taxi, people carrier or bus at a fixed price, although our drivers sometimes take a short detour to show you a sight on the way. Or you book an Arrival Sightseeing Tour. You will be picked up from the airport and the driver will then take you on a 4-hour private Sightseeing Tour through Barcelona before bringing you to the hotel. On the way you have the opportunity to stretch your legs, you can also book a breakfast or a tapas break. The airport train station is located opposite the T2-A / B Terminal. A pedestrian bridge from the terminal building to the station facilitates transfer, especially with lots of luggage. If you are traveling through Terminal T1, you can take the free shuttle bus from T1 to the station at T2. You can reach the bus stop for the shuttle bus when you leave the security area and going straight ahead (going around the café). After about 50 metres you come to the exit for the train station. Follow the signs (signs and lines on the floor). The shuttle buses run every 5 minutes between the terminals, and using these buses is free. Trains run every 30 minutes between the airport and the city centre. From the airport the single line of the R2 North line runs to the main Sants Estació station. The ride from the airport to Sants Estació takes 17 minutes. 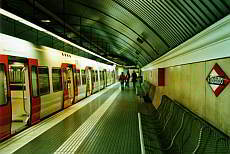 From the station you have access to the Metro network in Barcelona (lines L3 and L5). From here you can get without changing directly to the old town and Plaça Catalunya with the L3 Metro, and to the Eixample district with the L5. If you have booked the Barcelona Card or the Hola BCN! ticket, the train ride from the airport to the city centre and within the city of Barcelona is included in the price, as well as the use of the Metro and other public transportation. Taking a taxi is the easiest way to get to your hotel. At the T1 Terminal go to the taxi rank when you come out of the security area; about 30 meters straight ahead and then go down to the exit. The ranks are well signposted. At the T2 Terminal the taxi rank is located right outside the terminal building. For the taxi, you have to expect to pay €30-60, depending on luggage, time and route chosen. Added to this are surcharges for the airport and large luggage. The availability of taxis is very good, but you can expect to wait in line. Do not expect that the taxi drivers speak English or even German. Usually, taxis drive you directly to your destination. If they have to take a smaller detours, for example because of a construction site, the driver will tell you. Unfortunately, there are also black sheep: check if the driver has turned on the meter, you are only obliged to pay the indicated amount. Request a receipt "ticket", this must contain the license number. If the driver drives an incomprehensible detour, then point out that you want the direct route. Write down the taxi license number and name, they must be clearly visible in the taxi. When the driver enters the destination address into his navigation device, this often indicates a lack of local knowledge, but if he follows the sat nav, the route will be without unnecessary detours. Since February 2016, the metro line L9 runs from both terminals into the city. You can get from the airport to the city quite easily: change at the station Collblanc in the line L5 that takes you directly through the Eixample district or go to the end station and then change to line L3 that leads you directly to the Old Town. But that takes much longer than the bus 46 or the Aerobús. For the L9 a special ticket is necessary, this costs 4,50 € per direction. The Metro L9 is included in the HolaBCN! ticket and the Barcelona Card and no extra ticket is required. With the Barcelona Card you get free public transport in Barcelona as well as from the airport free usage of the Bus 46, the train and the metro L9. Many more discounts. With the Hola BCN! you get free public transport in Barcelona for 48, 72, 96 or 120 hours. Included are the metro, the busses (TMB), the Bus 46, the train and the metro L9 from and to the airport. With the Private Transfer we will pick you up right in the arrivals hall of the airport and will bring you to yout hotel. For your departure we will pick you up at your hotel and bring you to the airport. Please choose the desired vehicle and enter the necessary data. For the Arrival Transfer we need the estimated arrival time of your airplane, for the Departure Transfer the desired pick up time. Estimated number of people. Note the maximum of the vehicle. Expected number of persons. Please consider the maximum number of the vehicle. Book an Arrival Sightseeing Tour and get an overview of the city in a comfortable way. On request you can book a Tapas or Breakfast Break for your tour. Please enter the date of your arrival and the scheduled arrival time of the aeroplane or ship. Then select the vehicle you wish to book. The Tapas Break and Breakfast is bookable from 8 persons. Book your tickets here without queuing. You can save a lot of time.